AlNiCo is a type of permanent magnet which is made from an alloy of Aluminium, Nickel, Cobalt and Iron. AlNiCo magnets are suitable for Reed Switch applications that require a high service temperature as some grades of AlNiCo magnets can work up to 550C. Contact us for Reed Switches and Reed Sensors! 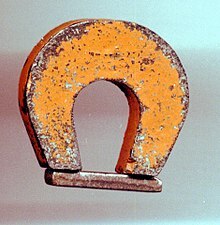 A "horseshoe magnet" made of Alnico 5, about 1 in high. The metal bar (bottom) is a keeper. Placed across the poles when the magnet was not in use, it helped preserve the magnetization. Alnico is a family of iron alloys which in addition to iron are composed primarily of aluminium (Al), nickel (Ni) and cobalt (Co), hence acronymal-ni-co. They also include copper, and sometimes titanium. Alnico alloys are ferromagnetic, and are used to make permanent magnets. Before the development of rare-earth magnets in the 1970s, they were the strongest type of permanent magnet. Other trade names for alloys in this family are: Alni, Alcomax, Hycomax, Columax, and Ticonal. 400 oersteds (32 kA/m), double that of the best magnet steels of the time.